How was your weekend? It snowed here – twice! Too bad it melted before we could play in it but it was fun to get all bundled up. Wearing a scarf and hat makes me instantly feel all 1940s. Do you wear hats? My cousin Katie is a super stylish young gal who recently spent a semester in Paris. Now every time I see her I try to pick up a few tricks on how chic French ladies dress. Apparently a few months abroad will make you a master at tying scarves – something that has always baffled me – but Katie showed me the easiest trick. It’s now my favorite way to tie a scarf! I love that this looks all knotty and complicated but is super easy. 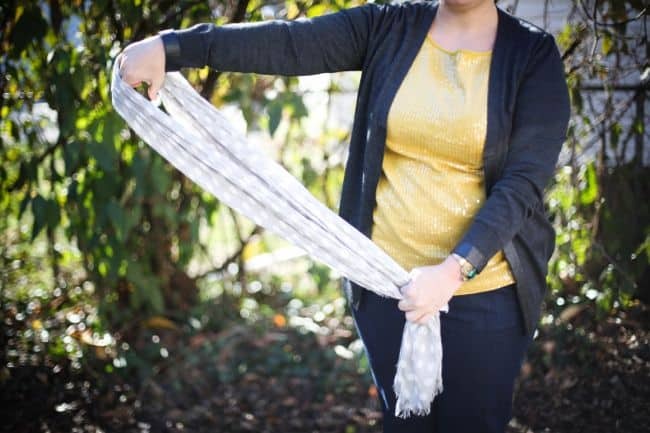 First, take a long scarf and fold it in half lengthwise. Take the second free end and go under the loop and then back over. Adjust the length as needed. After you practice a couple of times you’ll get the hang of it. Add red lipstick and a hat and suddenly I feel all kinds of French. 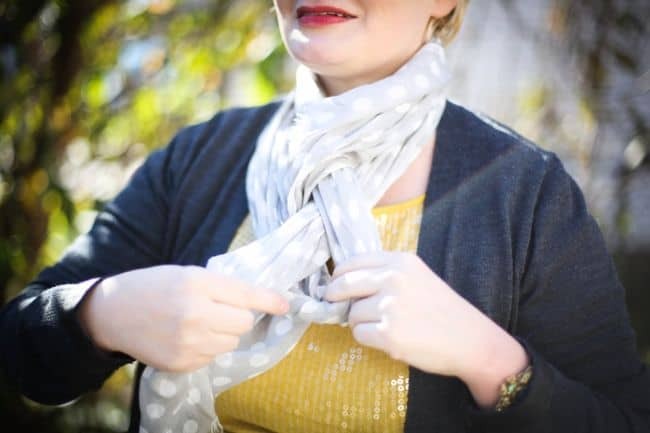 How do you tie your scarves? Soo easy! Love the pictures. Thanks for a great post. Best scarf tying instructional ever! Great pictures and so easy to follow! Thank you. Love it ! Looks almost braided ! That looks great and I absolutely love the hat too :) I’ve always said you should wear more hats! I will have to try this scarf method too, thanks! Lovely! 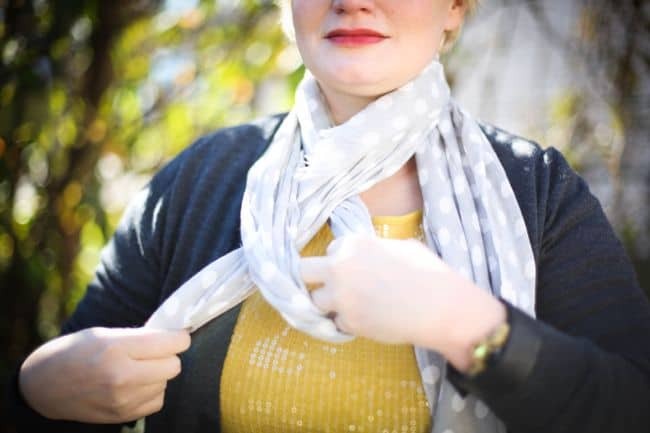 That is actually one of my favorite ways to tie a scarf… it’s not too tight around the neck and the scarf lays nice and flat and stays put. :) Cute yellow top! Thanks for the tutorial! I don’t know anything about how to tie scarves! I totally tie my scarf the same way! I always teach my admirers-it’s such a lovely way to work it! I did it!!! Thanks for showing me how! Thank you! Always wondering how to get that look! Ooh so cool! I have to try this! You totally look French Chic Stephanie! So easy and pretty. Now if only is wasn’t 30C (90F) here and too hot for scarves. Will save this idea away for winter. I was just saying today that I can’t wait for 90 degree days! Yay for summer!! Tried it! Love!!! I’m going to post a picture on my blog and link to yours for instructions…and I love winter hats and scarves, very excited one I’ve been crushing on just went to clearance at Target. So easy, right? Target has such great hats, can’t wait to see yours! 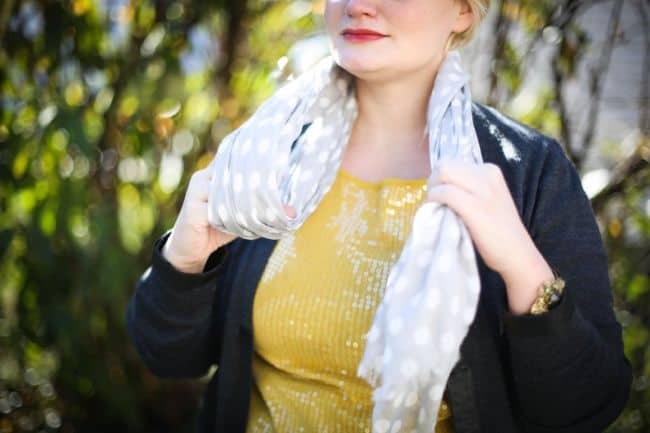 I LOVE those kind of scarves!…I have a bunch of colors and only a couple prints. As for hats I love them but they tend to smoosh my bangs, making them cover my eyes..but I keep trying! You look brilliant. 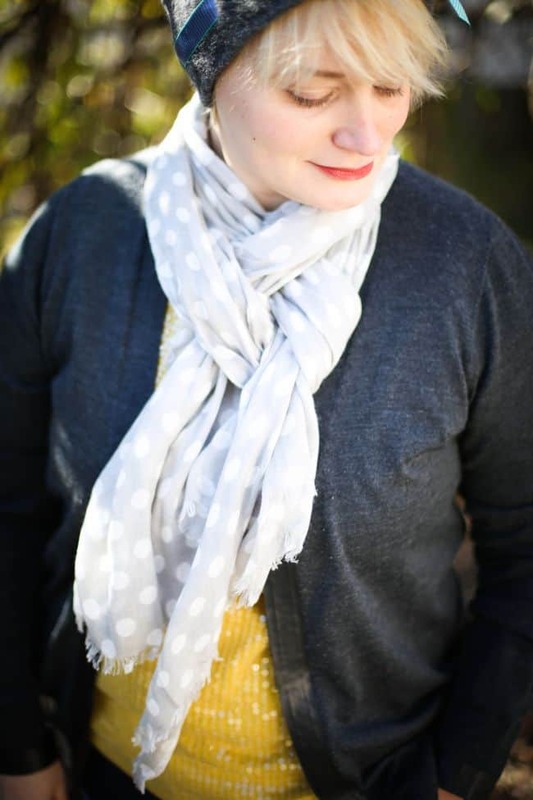 Yep, I always seem to buy bright colors and prints that end up going with, um, nothing :) This gray scarf that I got for Christmas has been perfect. And I hear ya, I love wearing hats – just not taking them off, ha! How pretty! I love the first click a lot! Great Way to Tie a Scarf! I wear alot of scarves so this is a perfect turtorial! Thanks! Love! Will try today!! Please post all the French fashion, I’d love to try stuff. Oh la la…so fancy! I’ve never seen it done this way! Love this trick! I just tried it in the mirror until I got the hang of it! Also, that hat is adorable! 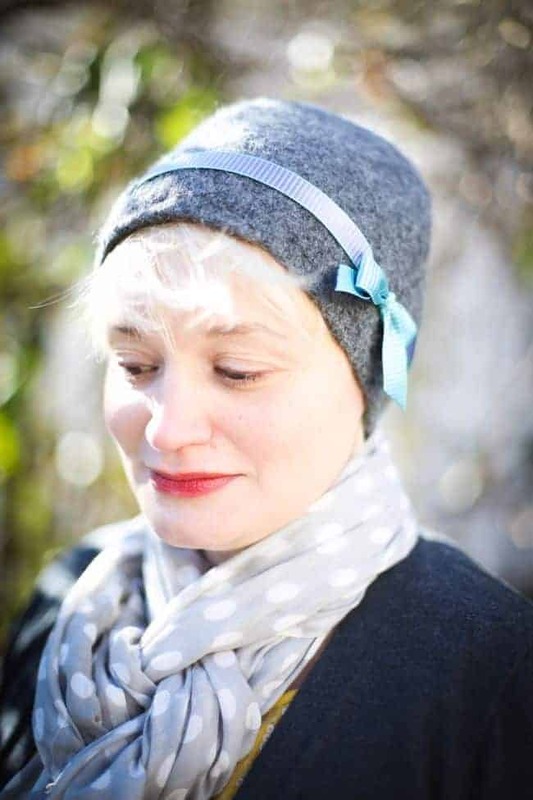 I’ve been coveting Julie Sinden’s hats for so long! Yay! I had to practice too, but once you get the hang of it, it’s a cinch. You should totally get a hat – love her! Ooooohhh fancy shmancy!!! I love that! I had learned how to tie a scarf that way once and then forgot how to do it. Thanks to you and your chic cousin for reminding me! And yes, I wear hats … Winter, spring, summer and fall. I never leave home in the daytime without one. But after the sun has gone down, I only wear them in the winter for warmth. Yep, I’ve been wearing it this way pretty much non stop. It’s nice to finally get more use out of my scarves! I wish I wore more scarves. I am never in anything but a t-shirt and yoga pants, or scrubs. I tend to wear a cardigan around my neck like a scarf. Those knots make the scarf super cute. My days of actually putting myself together are limited too – maybe we should do a 30-day “get dressed” challenge?